Dental injuries are among the most common facial injuries sustained through participating in contact sports. Custom-designed and fabricated athletic mouthguards play an important role in the prevention of sports-related oral and facial injuries. 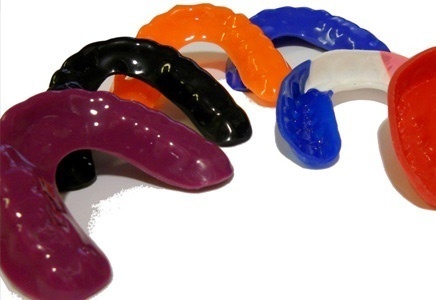 Canberry Dental creates custom sports mouthguards. Sports mouthguards are dental devices designed to protect your teeth during contact sports. At Canberry Dental our dedicated team of cosmetic dentists in Gungahlin works with athletes in order to properly diagnose, design, and create custom sports mouthguards. Sports mouthguards custom-made are designed to effectively protect the teeth from injury while minimizing interference with speaking, talking, and breathing. What type of Sports Mouthguards is the best? The “boil and bite” mouthguard. These are designed to be immersed in hot water, and then formed in the mouth using finger, tongue and bite pressure. When they can be made to fit adequately, they generally offer better protection than the first type—but they may still be uncomfortable, and usually fail to full cover the posterior teeth. Bring your mouthguard to each dental checkup, and your dentist can check to make sure it’s still in good shape. How can I learn more about Sports Mouthguards? We will be happy to discuss Sports Mouthguards at Canberry Dental. Please feel free to call us or book online. If you frequently wake up with a sore jaw, a dull headache or tooth pain, you may want to ask Dr Adam if you are suffering from a condition called bruxism. Bruxism or teeth grinding. Everyone grinds their teeth, but the amount of grinding or clenching their teeth varies from person to person and day to day. In general, when we are stressed, we tend to grind or clench or teeth. 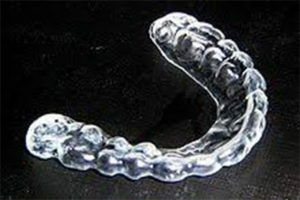 There are several ways to alleviate the effects of bruxism. One of the most common is a custom nightguard. This is an appliance typically worn while sleeping through the night. We recommend custom-made nightguard, which is made from an impression or mould of the teeth and is sent to a special dental laboratory. Custom made nightguard are superior to the over store bought since the custom nightguard is made of a higher quality and has a superior fit( so it doesn’t drop in your mouth while you sleep). This is generally a more expensive device than one purchased over-the-counter but can be more comfortable to wear. The main function is to prevent the surfaces of your teeth from grinding together, causing you to chip and crack your teeth and strain your jaw muscles. If a nightguard is uncomfortable, there are other possible treatments listed below that you can ask your dentist about. Teeth straightening: Teeth that are out of alignment–what dentists call malocclusion–can contribute to teeth grinding. This can be remedied by corrective measures such as braces. Stress prevention: One of the main causes of bruxism is anxiety, so relaxation, like meditation, can get you to relax and stop clenching your jaw. Change of diet or medication: avoiding stimulants, such as caffeine, to reduce teeth grinding. Certain medications, such as antidepressants, might also contribute to the issue, so make sure you tell us about any medications you are taking so we can suggest an alternative if one is warranted.